This ocean-oriented townhouse is two-stories with the entry and first floor a few steps above street level. Ocean Gate is within 1 block of the Atlantic Ocean beach. Vacationers seeking a quiet neighborhood and good value don't mind the short walk to and from the ocean and like parking at the front door of their condo. Living room sliders to a deck provide easy access to nicely landscaped courtyard and swimming pool. Guests staying in Ocean Gate enjoy biking or walking the leisure trail that leads to Colign Plaza and the Beach Park. This quaint downtown area offers a wide selection of restaurants, shopping venues, and entertainment for all ages. The location is great, just a 5- to 10-minute walk to the beach. Love the area of beach, very quiet. Unit was very clean. Could stand a little updating, but nothing urgent. It was great for our family of 5." We have stayed at Ocean Gate several times and love the location. Our condo has always been very clean and comfortable. We had a great week and look forward to coming back next year!" I have been vacationing in HHI for better than 30 years and have stayed in many different locations. This was the worst. No grill. Spartan furnishings, kitchen ware, furnishings. Dishes were dirty when we arrived and had to be washed. Air does not adequately cool the bedrooms upstairs. There are much better, more enjoyable places to rent for a comparable price. The location is good and bad. The beach is a fairly short walk across the Forest Beach Drive and down a path and due to the isolated location at the far south end of Forest Beach Drive, the beach is not crowded. However, this makes for a long walk/ride to Coligny, the Tiki Hut, etc. I was aware of this but just wanted to warn others. The beach is very nice, wide and reasonable private. Pool is OK. I was just disappointed in the rentals air conditioning, furnishings, and lack of a grill." We booked the Ocean Gate 9 townhouse for 3 nights and we couldn’t have been more blown away by the experience we had. We got there Friday night at around 8 o’clock which was after office hours but the company renting the place made the process to acquire the keys very seamless. After that, we got to the unit and it was really clean. Almost felt like home. Really didn’t want to leave Hilton Head after the awesome experience we had! " Very good location.Electric sockets need hair dryers,only2 chairs with outside table and being 4could not eat outside.dirty bathroom cabinet.bedroom bedside lamp had loose connection so kept going out"
The condo was in a good location for the pool and other activities. It is not a close walk to the beach especially for older people. The plumbing iin the bathroom off the bedroom with single beds needs repairing. (The sink and tub). The pool was very nice. " Easy access to beach, house needs some up keeping. Limited supplies in the house. We have stayed at ocean homes before they usuallywell kept. Price is right." We stayed in this townhouse when our original rentals AC stopped working. This was a very nice rental with access to the beach across the street. 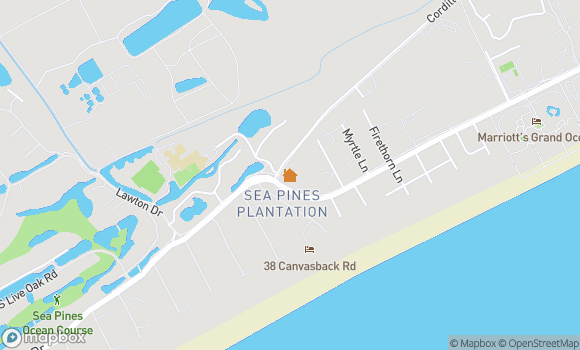 It was located by the entrance to Sea Pines which we enjoyed visiting. I would definitely stay here again. It was clean and well equipped with everything we needed. Seashore Vacations was extremely helpful in location a new rental for us." Overall the property was in a great location and was in generally good order. It was a little frustrating that none of the electric plugs in all three bathrooms worked. My wife had a hard time doing her hair and getting ready. The pool was very clean and very decent temperature. This property just needs a little love put into it to make it Great"
Loved this condo. Very roomy. Look forward to staying again. Close to beach, shopping and restaurants. The only thing that could have been better was if the pool got cleaned faster. But the hurricane had just caused lots of limbs so was understandable. Great place to stay. A grill on deck would be a nice addition too." Great Directions and very quiet and peaceful property. Convenient to pool. The property itself was in pretty good condition and the kitchen was well equipped, but the furniture in the living room area was in poor shape the recliner was terrible! Also no grill on deck and the deck had no umbrella or useful furniture to speak of so the deck really wasn't useable. Great property for the price, but could use some upgrading. " We were at Hilton Head for the week and needed two more days.We had to be out of our original place and Seashore found us this place for two extra days.Great little condo. " Excellent location, excellent amenities and ambience of Ocean Gate Villas. The specific villa we stayed in was in physical good condition but could have done with a deeper clean before move in." I have been vacationing on HHI for about 16 years and this is the worst rental experience I've had in all those years. I rented here because it was advertised as being within one block of the beach but I couldn't find the access point so we drove up to the nearest beach parking and access which is just up the road. When I sent a list of concerns to the management company they informed me that there was a dirt path just before entering Sea Pines. Overall the place was rundown. There were stains in the carpet, faucets (except the kitchen) were dated and hard to use. The deck has no umbrella so on a hot sunny day you wouldn't want to sit outside. There are cheap plastic blinds in the bathroom. The coffee pot was not clean and there was some dirty silverware in the drawers. Also there were discolored or dirty dishes in the cabinet. The walls were dirty in spots and were in need of a fresh coat of paint. The furniture is rundown and some of it needs replacing. The computer chair in the loft was broken and I couldn't sit in it at all. There are many places oh HHI that are much better for about the same money or even less. I won't be renting here again." Clean house and beddings. All what anybody need for perfect retreat." We enjoyed it very much. We would stay there again if we were to come back. Thought the price was very affordable." great location, very clean well maitained unit,spacious,great accomodation for 4-6 people,bonus:pool and tennis court,but ownners could add a hairdryer -for ladies and maybe decent barbecue for men,and new patio chairs to be able to sit on the beautiful patio"
We had a great stay at Ocean Gate! Convenient location to beach, Coligny, Salty Dog, and Harbour Town. We would defiantly recommend. My husband and I do think the unit needs some updates. And we were a bit concerned about the neighbors dog a Doberman. The dog growled at me with my 4 month old and then my husband. Over all a fun vacation. " We have been coming to Ocean Gate for a number of years now and find its location, with a pool at hand and miles of beach and cycle paths ideally suits our needs." Quiet Villa close to beach. Nice pool and tennis court with little use. Villa amenities adequate. Furnishings fair, beds xtra-firm, but did the job. Could use some paint as of 8-11-13. But nothing disappointing. I will stay here again as the villa, the quiet area, close proximity to the beach, and the pool/tennis courts are a draw." We loved our time in Ocean Gate. We are members of Diamond Resorts, so we are spoiled with the ability to stay at 5 star hotels and condos. This being said, our standards are a bit higher than the average traveler. This is why we rated teh cleaning and condition at a 4. The paint was older and the cleaning was not spotless, but other than that, WE LOVED THIS PLACE. It was close to a beach that was basically private. Yes...Labor Day weekend and there were only 2 other families on the beach. It was close enough to ride bikes to Coligny but far enough away to be quiet and peaceful. Being right outside the gate to SeaPines, we felt like we were getting the benefit of Sea Pines without the cost. There are not many villas, so the pool seemed as if it was ours. We LOVED this getaway...the villa had everything I needed to cook and plenty of space. The property management company was very accommodating and extremely sweet on the phone. If you are looking for somewhere to stay in HH...This is the place :D"
We were in a pinch because our original place that we were staying was awful. We called and were able to get in last minute at our condo. it was beautiful, spacious and in a great location. We will definitely be back!" "We had a very nice time - this was our second time staying at this property and were just as pleased as we were the first time. This ad has been viewed 537 times.